A Solo for 2 Drumsets Well over 7 minutes in length Spanning 12 styles, over 20 different grooves & open solos throughout. Play along tracks for each drumset on tracks 1 & 2 Both drumsets together Track 3. Includes spiral bound 3 pg. chart of the solo. Luna’s Lunch A Two Drum Set Solo. In addition to the cd, includes a spiral bound 3 page chart & 1 page of additional grooves for the solo not listed on the chart it self. Also dedication pages. Well over 7 minutes in length Spanning 12 styles, over 20 different grooves & open solos throughout. Play along tracks for each drumset on tracks 1 & 2 Both drumsets together Track 3. Written Composed & Arranged by Art Bernstein. Dedicated to Luna, Caleb & Ryan. A very Special thanks to Richard Albagli & The Empire State Youth Orchestra’s Youth Percussion Ensemble for including Luna's Lunch for performances in their 2005-2006 Season! A very Special thanks to Audix Microphones, Ayotte Drums, Dom Famularo, Sabian Cymbals, Vic Firth Drumsticks for their long time friendship & support. The 1st performance of Luna's Lunch was in November, 2005 with The Empire State Youth Orchestra’s Youth Percussion Ensemble. 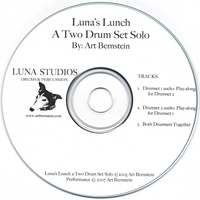 The Audio play-along tracks for Luna’s Lunch on this CD feature individual mixes of Art performing each drumset separately. "these are the play along tracks" Then Both Drumsets played together on track 3. Thanks for checking out the music! Drumset Basics for the beginner & breaking it down, some basic latin rhythms with DVD video for pgs. 57-82 "the latin rhythms section of the book". Rolls "Text only, audio & video are in progress for this release.